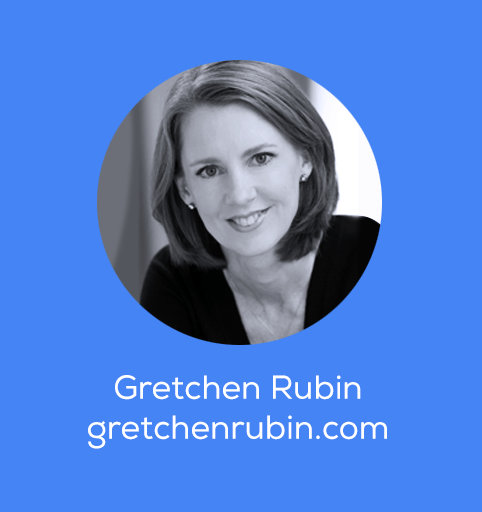 Gretchen Rubin is a prolific observer of happiness and human nature. She’s the author of many books, including the New York Times bestsellers The Four Tendencies, Better Than Before, and The Happiness Project. She also co-hosts a popular podcast. We discussed whether emails can make us happier. What’s your email routine like? I get up every morning at 6:00 AM and quickly check my email on my phone just to see what’s there and if there’s spam, I’ll delete it. If there are things that I can quickly do to clear out, I’ll do that from my phone. Once I get to my desk, I go through my email. I’ll answer whatever I can. If I need to follow up with something, like someone asking me for information that I need from someone else. I get that whole process started. I also go back through my emails for the last several days to see if there’s something that I haven’t dealt with yet that I need to deal with. And then throughout the day, I’ll check in just depending on the rhythm of my day. So if I’m doing original writing—which is the hardest, most challenging kind of work I do—for like three hours, I will not check email and I won’t look at the Internet, I’ll just be very focused on my work. But in a day, I’ll check email after a meeting or if I’m in between interviews. Even if it’s Christmas Day or vacation, I don’t like to be away from it too long. Some people find that relaxing. I always want to feel like I know what’s going on in my email. Is it hard for you to focus on work and stay away from email? How do you do that? In my office, I have three monitors and I have my email up the whole time and other tabs open. If I’m going to write, I’ll go to this little library that’s a block from my house or I’ll go to a coffee shop. I physically move myself. Now, I can check my phone at any time, but I’m in that mode and that’s a signal that I’m doing a different kind of work. Do you still send family update emails? My mother pointed out that for people who you see all the time, you have a ton to tell them. But when you see people very rarely, the mundane things make us feel more connected. So from time to time, maybe every five days or 10 days, we send each other an email and the subject line is usually, “update.” The motto of “update” is “It’s okay to be boring.” And you literally write down the most boring, mundane detail. So it’s like: I’m going to the dentist or my dog Barnaby threw up on the sofa. It’s just a list of what’s going on in your day. And we found that it dramatically influences our feelings of being connected because you know what’s going on in someone’s day. So when you see an update, you don’t have to respond. It doesn’t create any work or any sense of obligation, you just read it and then delete it. For ours, the minimal effort is exactly what you’re expected to do. It’s something that you just do when you have a little bit of time to help everybody feel connected. You’ve written about how people tend to fit into one of four tendencies. How can understanding which tendency shapes your behavior help guide our email habits? So the problem with email for most people is actually getting other people to respond. So how can we use the four tendencies to make it more likely to get a response? Upholders are probably not going to be your problem because Upholders are the kind of people who are probably pretty on top of their email. The problem you could run into is questioners. Questioners want justification. So if you say something like, “please get back to me by the end of the day” to a questioner, it feels arbitrary. They’ll wonder why you need it by the end of the day. And they’ll just disregard it because to them, it seems like there’s no justification for that. With Rebels, it’s a good thing to include things like, “if you have the time and the inclination, could you do this?” Rebels want to do their own work in their own way. So as much as you can remind them that it’s up to them, then they’re going to be more cooperative. Rebels want to be strong team members, but they don’t always want to do what you tell them to do. So sometimes it’s just remembering people’s choice, freedom, and identity rather than telling them they have to do something. Rebels don’t want to be told that they have to do anything. A Rebel once emailed me and said that she got an email that said “please respond” and she deleted it without reading because she didn’t want to be told what to do. So you need to think about that, especially if you know you’re dealing with a Rebel. One thing that many Obligers have said is that the Obliger rebellion takes the form of refusing to answer emails. I find that Obligers can be bad about answering emails when their tank is full and they just can’t deal with email anymore. And then they just don’t. If you feel like that’s happening, you need to say to that person, “I’ve noticed that you haven’t been that responsive on email, is there something that I can do that could change that?” But sometimes I think Obligers feel so much pressure to answer everyone’s email that they just can’t, so they don’t. What’s a good approach for establishing communication with new contacts? For instance, I always prefer email versus a phone call or a text— unless it’s urgent. Also, I’m a morning person so if you have something that really needs my attention, send it in the morning. My literary agent and I are both morning people. We will do a huge amount of work at like 7:00 AM by email because we’re both at our desks and undistracted. There’s two schools of thought with email. One is that people don’t like to get emails, so if you’re sending someone an email, you should put in every possible question, comment or piece of information so they’re not bombarded with multiple emails. That’s not my philosophy. I like to have every subject line be very clear so that people can easily look back and trace something. If it’s a question and I’ve answered your question, I’ll delete the email. I will often end up sending someone like five emails in the span of a minute, each with a different topic. It makes it much easier to keep track of what you’ve answered already. Do you have any tips for subject lines? I’m a big fan of changed subject lines. 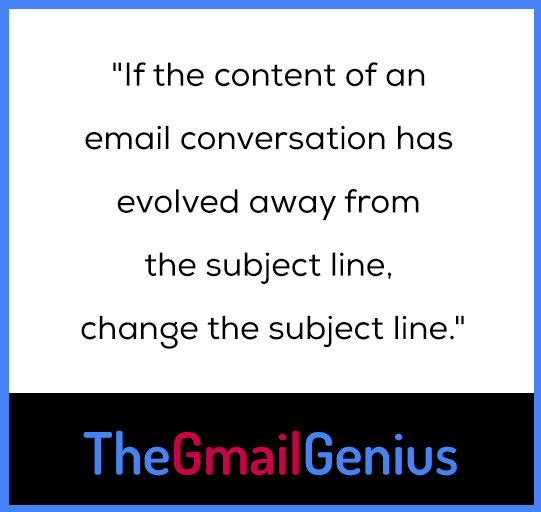 If the content of an email conversation has evolved away from the subject line, change the subject line and you can keep all the previous conversations. You don’t have to start a new email but change the subject line so people realize we’re talking about something new. If you’re managing a lot of conversations, it’s sometimes hard to find specific information and this makes it easier. As an Upholder, I feel like everybody should do their work in their own way. My way is to work constantly. I work on the weekends and start at 6:00 AM. So I’ll send you an email whenever it occurs to me, but I won’t expect you to answer it until it works with your workflow. What I found out is that some people were really annoyed by that because as Obligers, they felt like I was expecting them to answer on holidays and over the weekend. They felt pressured to do that, and they resented it because they felt like I was overstepping my boundaries. So I now use delay delivery functions on my email. Are there things we can do to be happier emailers? Like on a recent episode of the podcast, you mentioned not filling in the “to” field until you’re ready to send it. I think sometimes people really enjoy picking a quotation for their signature and they change them frequently. I always read them. I think adding a quotation in a signature line really tells you something about someone: what they value, who they admire and the kinds of thoughts they’re trying to put out into the world. I think that that’s a way that you can put your stamp on something that can often feel impersonal.